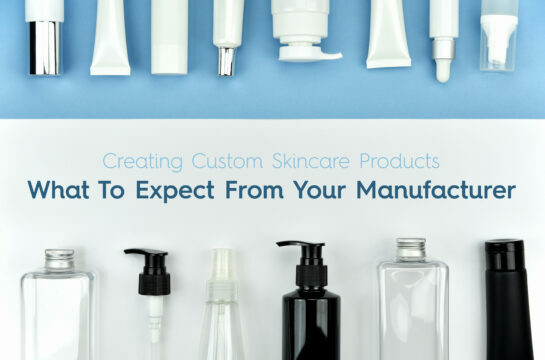 Think you’re ready to work with a private label or contract manufacturing house to create your custom skincare product(s)? Great! Now is the perfect time to ensure that you can afford both the time and financial commitment necessary to hire a third party to create and manufacture your products for you. In this first blog of the three-part series, we’ll talk about the Research & Development (R&D) phase of contract manufacturing and what you can– and should expect, from your manufacturer. Before we jump into a discussion on contract manufacturing, let’s first define what we mean by each term and the relative benefits of each type of service as you create your custom skincare line. This is the fastest, most economical way to bring your product line to market. Just select one of our ready-to-market products or raw ingredients and we will fill your containers, label, kit, and ship to your warehouse, to Amazon, or to another fulfillment center. If you’re looking for bulk, just order directly from our website any time you need to. Are you looking for something just a little bit different than what we currently offer? We will customize our stock products in our lab by adding essential oils, changing carrier oils or butters, using different additives, or other similar modifications. We can provide your semi-custom product in bulk, or we can fill, label, kit, and ship in your packages. Need something unique to your business? You can contract with us to create a customer-formula from scratch in our lab. We can also ship your product in bulk, or fill, label, kit, and ship to your distribution center. Creating a custom skincare product from scratch takes time. Period. If you short-circuit the process you may end up with a product in the market that separates, doesn’t hold its color, eats into your packaging, grows mold, or just plain isn’t liked by your customers. All bad things! Only time will give you the opportunity to be confident your product will hold up in the marketplace, so please be patient. You might think that a 30 to a 360-day window is a bit ridiculous, but it’s actually quite necessary. The research and development phase is a time for both art and science and is the foundation for your products’ success. When you hire a lab to create a formula, you are hiring them to research and develop a product for you that may take 20 or more versions to get to exactly what you want. Sometimes we get it right on the very first try. Sometimes products fail on the bench and they never get to you to review. Sometimes we send out what we think is exactly what you’ve asked for and you don’t agree. And sometimes we send out a product sample for you and we find 10 days later, the color is fading or the oil has separated or the pH is dropping. The first time we create a product formula, we do not know for certain exactly what the resulting reactions will be. The old adage, we cannot know what we cannot know, is applicable here. The chemical composition of natural and organic products will react to one another differently when, for instance, water at 110°F is used as opposed to water at 130°F. You might love the color of manganese or beetroot or hibiscus but find that when they combine with a preservative or a surfactant, the color changes. We recently ordered a new batch of manganese. When we tested it for oil solubility, the color was the same as the previous lot. When we tested for water solubility, the color became a dark muddy brown. This is going to happen more frequently when using natural non-synthetic ingredients and as part of our R&D, we have to have time to experiment, even with ingredients we frequently use. Before your project ever goes into the lab, you’ll want to have one or more calls with the formulator who will be working on your project. Of course you’ll have an account manager with you on your project, but we advise having at least one conversation with the lab so they can hear your exact words and can ask you any specific questions, such as ingredients they are thinking about but that you may not have heard of, or concerns they have with being able to achieve your goals within the parameters you may have given them. Some of these parameters include: price point, restricted ingredients, organic certification, and so forth. This step gets you to have a technical conversation and helps you know what to expect. If you are simply making a scenting change to an existing product or swapping out a preservative system, this probably isn’t a necessary step. But if you are asking a lab to create from scratch or to build one of your own formulas, you’ll definitely want to have this call. It may seem like this step is out of place but actually, you’ll want to know what kind of packaging you’ll be using so you can test the samples in the same type of dispenser. Is the crème too thick for a lotion pump? Is the sprayer for your detangler going to clog up? Will the packaging hold up in the shower? The gym bag? Can you open the diaper balm jar with one hand? All those little things make a difference and your formulators will need to know how the product will be distributed. Ideally, you will send us enough packaging so we can send you samples back in your own packaging. Lab samples that pass our internal review are sent out to you for evaluation. An evaluation form accompanies all samples and each sample is giving a unique product identification number so you will always know which formula you’re talking about. You may have NewCo Lotion Formula 001, 002, 003, 004 and 005, with 003 being the formula with which you ultimately go into production. So keeping track of your formula numbers is essential. After you review your products and provide feedback you begin a communications loop that incorporates any changes into the next round of samples until you have an approved version you think you want to take to market. Your next step should be market testing and validation. You may like a product but that doesn’t mean your market will. Just as the market research you’ve done to inform your product desires is a step you wouldn’t think of skipping, getting samples of your products out to ambassadors or testers is another step you shouldn’t skip. We had a customer go into production with a product she loved. It turned out that her customers hated it. Returns were mounting, she was losing money and her biggest customers were losing faith in her overall product line. When asked about what happened, she admitted that she did not give samples to her future customers to get their feedback on her new product. Building in time to test with at least a small group of customers is critical to your product success. You may need to buy a minimum run of product in your packaging depending on how many testers you have or how you want to run the testing, but no matter what, you’ll get invaluable feedback that will inform the final product. Once you’ve finalized your formula choice, you’ll confirm your formula and start planning for production. This formally ends the R&D phase, but there is still science work to be done when your product heads to production and is scaled up for your production run. You’ll pass from the R&D to the Pre-Production phase with your formula, as well as the final list of ingredients for your labels and retail packaging. You’ll have the confidence of market research behind you, too. In the next blog in the series will talk about the phases of production, including third-party stability and challenge testing, quality control and the need for benchmarks to ensure your product is packaged and labeled exactly as you wish. In the third of the series, we’ll talk about distribution and logistics options to successfully bring your product to market. We hope this helps demystify the process of working with a private label or contract manufacturing house. If not, please feel free to leave questions in the comments below!